Your Case Is Our Cause. We Can Help. The Killino Firm handles the full spectrum of personal-injury cases, and is quite adept at handling those in which compensation for catastrophic and life-altering damages is sought, but is also well-versed in handling other cases along the spectrum. The firm has offices around the country from coast to coast, including Pennsylvania, New York, Florida, and California. Our accident lawyers, personal-injury lawyers, birth-injury lawyers, brain-injury lawyers, malpractice lawyers, and wrongful-death lawyers are licensed in those states and more, and many have pro hac vice admissions in other states and jurisdictions, as well. Our lawyers have extensive experience with all types of car accidents, product-liability, medical-malpractice, birth-injury, and a wide array of other negligence tort actions. Some of these have been high-profile and nationally-recognized actions with results that have benefited not only our clients but the public at large. Please know that we at The Killino Firm understand that your case is as important to you and your family as the most highly publicized cases handled by our firm. The Killino Firm is also equally proficient at keeping sensitive matters out of the public spotlight and securing confidential settlements. Every case is as important to us, and an appropriate strategy will be tailored to each case. We invest the very same expertise, skill, exhaustive dedication, and relentless advocacy into each and every one of our cases, from those in which we have achieved national recognition to the unpublicized, individual matters in which we have obtained justice and closure for children and other clients who have been injured or killed through someone’s thoughtless negligence or a defective product. The justice we seek and obtain for you is justice for all of us. The Killino Firm’s auto-accident lawyers, car-accident lawyers, motorcycle-accident lawyers, and truck-accident lawyers have extensive experience with accidents involving cars and other motor vehicles, know vehicle-accident law inside and out, and understand the complexity of damages and multiple-defendant liability that may be involved in such actions. Our car-accident attorneys, auto-accident attorneys, motorcycle-accident attorneys, and truck-accident attorneys work with esteemed and knowledgeable experts to conduct a thorough investigation of your case and to assess the nature and extent of your injuries, the causes of those injuries, and the damages you have suffered—and may suffer throughout your lifetime—as a result. Damages in such cases handled by our firm have been assessed against negligent drivers as well the employers of negligent drivers, such as trucking companies who allow their drivers to drive while fatigued and without breaks mandated by federal law. Our accident attorneys, injury attorneys, personal-injury attorneys, brain-injury attorneys, and wrongful-death attorneys have considerable knowledge of and experience with other types of accident cases, as well. Our wrongful-death lawyers and injury lawyers possess a thorough knowledge and understanding of product-liability law and have aggressively pursued legal action against the largest of corporations for injuries or death resulting from a defect in a corporation’s product. We hold the manufacturers, designers, distributors, and sellers of defective toys and other products responsible for their failure to keep their consumers safe by taking the care—and going to the expense—of ensuring that every product is reasonably safe for the consumer’s use. The manufacturers of cars and other motor vehicles, and the manufacturers of component parts of and safety equipment installed in such vehicles, have been found liable in product-liability actions brought by The Killino Firm for injuries caused or made worse by such defects. Many of the Killino Firm’s cases lead to medical-malpractice actions against doctors, nurses, and other medical professionals whose negligence in treating our clients has resulted in injury or death to patients who have entrusted their safety and their lives to their care. Our malpractice lawyers, medical-malpractice lawyers, birth-injury lawyers, and wrongful-death lawyers have considerable experience and expertise in myriad types of medical-malpractice cases, including those involving birth injuries resulting from the malpractice of medical professionals or a defective product used during a woman’s pregnancy or the delivery of her child. Our malpractice attorneys and medical-malpractice attorneys have brought actions resulting in recoveries against obstetricians, other physicians, nurses, physician’s assistants, and other medical professionals such as radiologists and anesthesiologists whose negligent performance of the duty of care owed to their clients resulted in injury or death to those clients. Many of the product-liability, medical-malpractice, and other personal-injury cases handled by The Killino Firm involve severe paralysis or brain injuries. Our brain-injury lawyers are highly trained in the law and medicine of brain-injury cases and work with other experts in the field to skillfully handle all brain-injury cases. 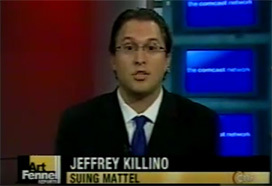 The Killino Firm is dedicated to giving its clients the most zealous legal representation and advocacy available and will fight for your right to compensation for the death of your loved one or for the injuries you have suffered as a result of someone’s negligence or a defective product just as passionately and effectively as we would if we were advocating for the rights of our own family members. At The Killino Firm, our clients come first and we give them our all. We are known across the country for the tenacious, intelligent, and aggressive pursuit of justice on behalf of all our clients.